The 127th Art Discussion Group Meeting will be held on Wednesday 18th February 2015 at 19.30hrs at MISCO OFFICE (first floor) in Fino Building in Notabile Road, Mriehel. 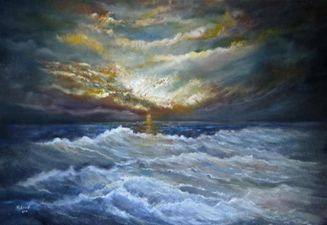 ADG is inviting Matthew Cassar a deeply involved and enthusiastic artist and teacher of art, a poetic dreamer with a lyrical fantasy, a profound interpreter of nature’s wonders, specializing in sunset and sunrise on a liquid element: the sea. The sea inspires him and stimulates his romantic and sentimental nature. He will answer questions from the floor regarding his vision, concept, and career. He will also elaborate about approach and technique. 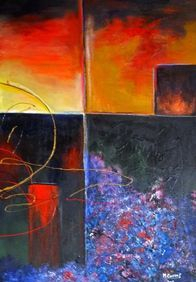 Quoting the artist: ‘My artistic vision and basic source of inspiration is light and atmosphere, dynamics and movement. I am fascinated by rough stormy seas as since early youth I used to observe and meditate rolling waves, studying their oscillatory movement and watching their progress as they rush and break on the shore. My favourite artist is Turner and I mainly work in oil’. The work of Matthew Cassar is redolent with romantic fervor and intense emotional feeling. His love of the sea and especially of waves breaking on the rocks is a recurring theme in his work. His rare and unique way of capturing atmosphere, mood and character of this wild element is the result of his deep sensibility and acute sensitivity. The lyrical and poetic way in which he captures nature’s mood reveals his reverence of creation, his tremulous intensity in the awe he feels when confronted by its cosmic spirit in open spaces. Matthew is an avid dreamer as he weaves reality, myth, magic and mystery. Matthew Cassar (b.1946) was born in Rabat. His father, was J.B.Cassar composer of songs, lyrics and music who participated in song festivals locally and abroad and won several prizes, also representing Malta in song festivals in several countries. He also organised several festivals for local artists and foreign singers. Brought up in an artistic milieu he was determined to become a painter and teacher of art. He was also a chemist and teacher of chemistry and physics. During his childhood Matthew Cassar used to read novels adapted for children and loved comics. The stories he read stimulated his imagination and fantasy and being a dreamer were the first sparks to ignite his creative talent. He attended several courses in art including a home study course in Master Art through Scranton University, Pennsylvania, U.S.A. He was awarded the diploma on the 27th of June 1994. ADG invites all members and their friends and the public to enjoy meeting Matthew Cassar and share with him the poetic and lyrical quality of his creations. 1961-1964: the Lyceum, Hamrun studied art under Chev. Esprit Barthet up to 'O' level exam. 1963-1966: attended School of Art Valletta. 1963-1975: attended St. Agatha School of Art in Valletta and Gzira under the tutorship of Mr. Anthony Mahoney and Chev. Francesco Borg. 1993-1996: completed a home study course in Master Art through the University of Scranton, Pennsylvania U.S.A. Awarded diploma on the 27th. June 1994. May 1993: appointed member of the Malta Society of Arts. July 1994: participated in Summer School of Landscape painting and drawing organized by the University of Malta, under the supervision of the late Ms. Isabelle Borg. August 1997: attended a course in Art History and Appreciation at the Euro Institute of Music and Art. October to May, 1997/98/99: attended lectures in Art History and Appreciation conducted by Fr. Marius Zerafa at Alliance Francaise de Malte. March 1998: completed course in Decorative Paint Techniques at the Euro Institute of Music and Arts. 2001: Summer period, Mtarfa Local Council Premises. Since 1964 to date he has exhibited his works at Art venues locally and abroad.